Thee people of Keltsbridge deserve a festival. They have completed the Lighthouse at Keltbridge Bay. The rafts that ferried the stones to the breakwater have been re-formed into the walls for new the keep. Now they can enjoy the prosperity they have worked so hard for. Yet another creative, beautiful map from Pirate Roberts! 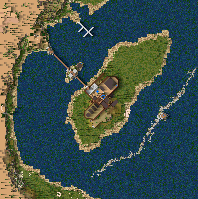 This time it's a castle on an island, with bridge access to the shore, where additional resources await development. Great use of palistone walls, and the design of the stockpile is something I haven't seen before. Terrific map, great fun!